JEDWARD, Ireland's twin pop sensations John and Edward, are heading to Australia in November 2013 for 3 Special Concert appearances. They have generated a phenomenon of ironic popularity described as "the JEDWARD paradox" following their appearance on the British "X Factor". They have released three platinum-selling albums, represented Ireland at Eurovision Song Contest in 2011 and 2012, presented two high-rating children's television series: "JEDWARD's Big Adventure" (currently in its third season), "OMG! JEDWARD's Dream Factory" and numerous guest appearances on major television serials and talk shows worldwide. They were even voted more popular than The Beatles in a teenage poll, and when Yahoo launched the Best Boy Band of 2012 JEDWARD were outright winners over One Direction and The Wanted. Following sell-out concerts in U.K, Ireland and Europe under their belt, JEDWARD are bringing their "pop superstar" status to Australia in November 2013. JEDWARD are John and Edward Grimes, twins from Ireland. They have become hugely successful musicians, television personalities, actors, models and celebrities throughout Europe. JEDWARD have released three Albums; "Planet Jedward" in 2010, "Victory" in 2011 and "Young Love" in 2012. Their first single "Under Pressure (Ice Ice Baby)" featuring Vanilla Ice, debuted at No.1 in Ireland and No.2 in the UK charts. For two consecutive years JEDWARD were voted to represent Ireland in the Eurovision Song Contest. They performed "Lipstick" in 2011 and "Waterline" in 2012. 'Lipstick" has become a world wide success, it remains a firm favourite to download on itunes. John and Edward had the honour of performing their hit single "Lipstick" for President Barrack Obama, when he visited Ireland in 2011. Since February 2013, the twins have had an extremely busy schedule. Promoting their current album "Young Love", has brought them to Canada and Australia, where they have appeared on several national Radio and Television stations. Jedward were in LA for the month of May, where they were busy working on and producing their own music videos. John and Edward appeared at the highly publicised Canadian MMVAs in June 2013. The twins have toured extensively, during the last three years, playing hundreds of Sold Out concerts across the UK, Ireland and Europe. They have just completed their latest Irish Tour and will be embarking on a UK tour at the end of September 2013. In Yahoo's Best Boy Band Poll of 2012, JEDWARD beat One Direction and the Wanted to take First Place. The London 2012 Olympic Games Committee personally asked JEDWARD to carry the Olympic torch through the streets of Dublin. John and Edward have made their own reality series, 'JEDWARD Let Loose' which followed them as they prepared to release their first album in 2010. In 2011, Edward and John took part in "Celebrity Big Brother UK" in 2011. To date the twins have starred in two television series, "Jedward's Big Adventure" on BBC/CBBC in the UK and "Jedward's Dream Factory" on RTE in Ireland. Both series have completed two seasons with outstanding ratings in both the UK and Ireland. "Jedward's Dream Factory" has been nominated for two IFTAs (Irish Film and Television Awards). A third series of "Jedward's Big Adventure" starts. filming in September. Since appearing on a number of prime time Australian TV channels, the boys are preparing for their first Australian tour in November 2013. Jedward are John and Edward Grimes, twins from Ireland. They have become hugely successful musicians, television personalities, actors, models and celebrities throughout Europe and the World. This is not only through their live performances and TV appearances, but also through their You Tube videos which have been viewed by millions World Wide. For two consecutive years Jedward were voted to represent Ireland in the Eurovision Song Contest. They performed "Lipstick" in 2011 and "Waterline" in 2012. 'Lipstick" has become a worldwide success, it remains a firm favourite to download on iTunes. John and Edward had the honour of performing their hit single "Lipstick" for President Barrack Obama, when he visited Ireland in 2011. Since February 2013, the twins have had an extremely busy schedule. Promoting their current album "Young Love", has brought them to Canada and Australia, where they have appeared on several national Radio and Television stations. 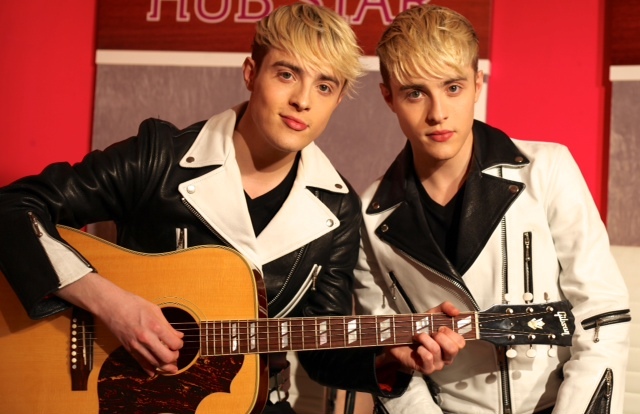 Jedward were in LA for the month of May, where they were busy working on and producing their own music videos. John and Edward appeared at the highly publicized Canadian MMVAs in June 2013. To date the twins have starred in two television series, "Jedward's Big Adventure" on BBC/CBBC in the UK and "Jedward's Dream Factory" on RTE in Ireland. Both series have completed two seasons with outstanding ratings in both the UK and Ireland. "Jedward's Dream Factory" has been nominated for two IFTAs (Irish Film and Television Awards). A third series of "Jedward's Big Adventure" starts filming in September.